Adam Sandler has been a comedic movie star for so long, most people might not know—or just plain forgot—that before he rose to prominence as a Saturday Night Live writer and cast member in the 1990s, Sandler was a stand-up comedian. For the most part, Sandler was absent from the live stage as his Hollywood career took off, but recently, the star of Happy Gilmore, Billy Madison and The Waterboy returned to the comedy circuit, headlining with pals like David Spade and Nick Swardson on a series of Netflix-sponsored tours. 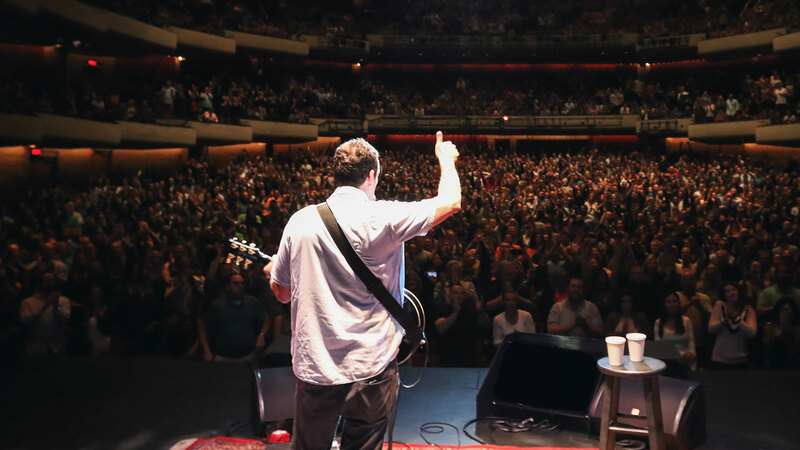 And on Nov. 10, Sandler will launch his first Las Vegas residency with a handful of dates at The Chelsea inside The Cosmopolitan of Las Vegas (we know a guy if you’re looking for tickets). To get pumped for those shows, we figured now would be a good time to look back at some of the reasons Adam Sandler became—and remains—a comedy star. Did you know Sandler is a Grammy-nominated recording artist? Well, now you do. Over the course of his career, he’s released five comedy albums, the first two going double platinum, and two others going gold, selling a total of 6 million albums. Why? Because they are legit hilarious, folks. Packed with skits, songs and appearances by his comedic pals, Sandler’s albums have inspired several of his movies, and contain enduring bits like the ridiculous “Buddy” from his debut, They’re All Gonna Laugh at You! One of Sandler’s most popular characters during his five-year Saturday Night Live run was Opera Man, in which he’d show up on “Weekend Update” in a wig, cape and tux to sing about the week’s headlines in exaggerated faux-Italian. Some of the best moments happened when he tried aping other signers’ styles in the same operatic style, as he did with Eddie Vedder and Harry Connick Jr.
Let’s face it: Prior to Sandler’s “The Chanukah Song,” its namesake Jewish holiday didn’t really have a lot of prominence in pop culture. (Sorry, “Dreidel, Dreidel.”) But since debuting it on Saturday Night Live and recording it on his second album, the song (which Sandler co-wrote with Robert Smigel and Ian Maxtone-Graham) has become a holiday staple, whose name-checks of (mostly) Jewish celebrities have been updated over the years, to audiences’ delight. We basically have Judd Apatow’s dramedy Funny People to thank for Sandler’s return to stand-up after many years away from the mic. To prepare for his lead role as comedian George Simmons, Sandler actually hit real-life comedy club stages, working on material that would end up performed (live!) in the film. Much of Sandler’s film output has been PG-13, so casual fans might be surprised that his stand-up material is decidedly more … adult.